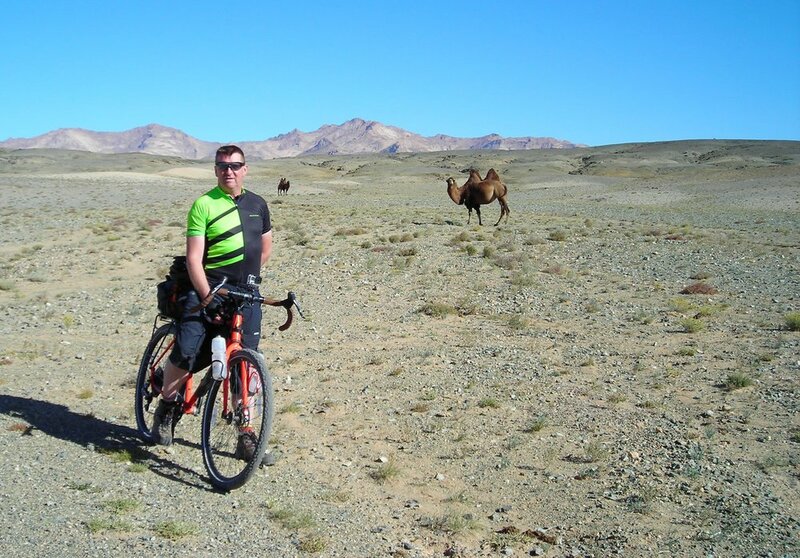 Adventurer Newall Hunter has just arrived back from a summer crossing of the Gobi Desert by bike. At 1950km over about three weeks, the supported trip was an adventure in itself, but in fact its main purpose was as a reconnaissance for a second expedition, to take place over winter 2017-8. This will be an unassisted solo crossing of the Gobi on foot, from west to east, covering around 1750km in all. He expects it to take 70-90 days and for temperatures to drop to around minus 30 or minus 40 degrees. Having completed the ‘Adventurer’s Grand Slam’ (summiting the highest peaks in each of the seven continents and reaching the two poles) and many other smaller mountaineering and other challenges, Newall Hunter has considerable form. How did it all start? ‘There wasn’t really a moment when I realised I wanted to spend my life as an adventurer. It sort of sneaked up on me. I grew up in the mountains of Scotland and climbing them was a thing we just did. And the mountains got bigger and bigger and the trips longer and longer. So there was no conscious plan early on. Why the Gobi in Winter? And why now? I was kicking my heels after the Adventurer’s Grand Slam, which I completed in 2016, thinking of ideas because I still wanted something to do, when I realised that nobody had crossed the Gobi in winter. It has been done in summer, but never in winter. So it’s mostly that it had never been done before. How important is the physical side in a crossing like this? I will be hauling a cart with all my supplies and equipment which may weigh up to 130kg to start with, so I have to get in shape for this. I have a pretty good base level of fitness, but I will drag a few Landrover tyres through the forests of the Cotswolds where I live because that’s the best simulation for dragging a cart. After the Antarctic, when I dragged the pulk weighing 90 plus kg, I am relatively confident on the physical side. Because I was completely alone for the 42 days on the Messner route to the pole, I also know I can cope with the continual long days of dragging my equipment on my own. Growing up in the mountains helped me to understand this and develop, but I’d say it is 90% luck to have the ability. You’re just built for this sort of thing. The Gobi is incredible country, really remote and unvisited - you can go for days without seeing anyone. It’s 2000km across, so it ranges from the unending grassland of the steppe with its occasional weird hillocks that look as though they have risen from the bottom of the sea, to jagged mountains that soar from the plains. They have been sand-blasted for millennia and now some look almost as though they’re made of glass. After the unchanging nature of the Antarctic, it’ll be a relief to have some scenery and some perspective. Part of the reason for cycling the route on the reconnaissance is that anywhere a bicycle can go I will be able to use my cart. There are quite a few tracks in the desert – vehicle and motorbike trails and animal tracks to the water holes - but there will be times when I simply take off cross country. In some places, where the sand dunes are impossible for a cart, for instance, I will be heading north into the Altai Mountains. Most of the Mongolian steppe is at about 3000ft but I will climb to 8000ft a couple of times. In winter the temperatures will range from about -5 to -25, though it is likely to get down as far as -40 on some occasions, which is comparable to Antarctica. Also there’s the wind, which will be at my back. In September it was pretty constant but topped 50 knots on a couple of days. I am told that in winter it will be less extreme. I considered doing the crossing from east to west – because the water sources would be more reliable near the start of the trip, when I will be pulling significantly more weight – but it would be impossible to make the journey into the wind. What will be the most significant challenge? We realised very early on that water was going to be the main issue. Unlike at the poles, the snow is not reliable in the Gobi and so I will have to find water along the way. We looked at all sorts of hi-tech solutions but we eventually concluded that I’ll just have to look for it. This means that instead of just carrying 300 ml of fuel to use each day, in order to obtain the 7 litres of water I need from snow, I have located water stops every three or four days. Even then I might end up carrying 15 or 20kg of water in my cart to last me between the wells and other water stops. There’s one stretch of 280 kilometres with some deep wells that the nomads assure me will not freeze, but if that turns out to be untrue, or if the water freezes higher up, say in the mountains, then it could be game over at a stroke. What else have you had to consider? My target is to move at about 30km per day, which means I would complete the crossing in around 75 days, but there are so many variables. One issue will be to make sure that I don’t injure myself. I know my body well and I will be working at a level to ensure that I don’t pull a muscle, but you can’t predict an accident. Hauling my cart up and down some steep slopes in the mountains will be hard and a broken leg up there could be very serious. I enjoy the planning and I think things through very carefully, but in the end some risks have been impossible to mitigate entirely. The local herders have assured me that certain water-holes remain unfrozen over the winter, but I won’t know till I get there. Getting back alive. I don’t see not completing the crossing as a failure. The only failure would be to die or get badly injured out there. Newall Hunter’s expedition to cross the Gobi Desert in winter will start in November. He will travel solo and unassisted (ie without using kites or camels), collecting water and fuel (camel dung) from the land. He will travel as far as possible unsupported, but will take advice and perhaps some help from local nomads along the route. You can find out more about his crossing and track his progress at his website and follow him on Twitter here. But will there be water in winter...?